By Allison Renner October 26, 2018 October 21, 2018 Governance, YALSA Info. Ever wanted to get to know the YALSA Board of Directors more? Here’s your chance! All month long, we’ll be posting fun mini interviews with each board member so you can get to know them a little better. Here’s the next Director. 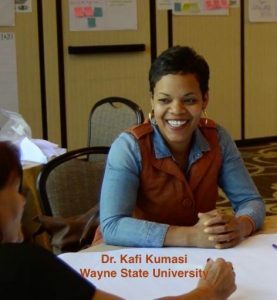 Kafi D. Kumasi is an associate professor of library and information science (LIS) at Wayne State University, Detroit, MI, where she teaches in the areas of school library media, urban librarianship, multicultural services and resources and research methods. A Laura Bush 21st century scholar, she holds a PhD from Indiana University, Bloomington and a master’s degree in LIS from Wayne State. Her research interests revolve around issues of literacy, equity and diversity, particularly in urban educational environments spanning K12 and graduate school contexts. Her publications include book chapters, and journal articles in (among others) Journal of Education for Library and Information Science, The Journal of Research on Libraries and Young Adults, School Libraries Worldwide, School Library Media Research, and Urban Library Journal. YALSA: What does YALSA mean to you? KDK: YALSA means that I have a dedicated space to bridge my research around issues of youth, literacy and librarianship with policies and best practices for teen services professionals who ultimately reach young adults through their work in libraries. YALSA: What are your hopes for the future of teen services? KDK: I hope that teen services expands in ways that attract young people to get involved with libraries by the sheer relevance and fun that they see possible from existing programs and services that reflect the way they live and learn today. YALSA: What are the top 3 things on your bucket list? YALSA: What show do you like to binge watch? KDK: I recently binge watched all 3 seasons of Insecure in a single weekend. I am absolutely smitten with the fresh take on life for a 30 something Black woman from Inglewood, CA. It has all the things I enjoy in a series and leaves me wanting more. YALSA: Name one cool fact about yourself. KDK: I teach Zumba and have a twin brother. Allison recently graduated with her MLS and is a new teen services librarian in Memphis, Tennessee.